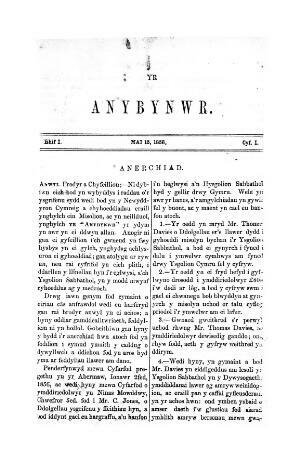 A monthly Welsh language periodical that serviced the Congregationalist denomination, mainly in north Wales. The periodical's main subject matter was articles on religious affairs and also on more general issues. Amongst the periodical's numerous editors was the Congregational minister and college principal, David Rowlands (Dewi Môn, 1836-1907) and Josiah Jones (1830-1915). Associated titles: Yr Annibynwr (1857-1864); Y Dysgedydd (1865).